Sunny skiing in this Italian spa resort. Bormio was first built up by the Romans as a spa town and has risen to become one of the most popular resorts in Italy. At heart it is a small medieval market and spa town and itâ€™s character reflects this - it has great atmosphere - especially in the evening. Beginners will find a good selection of nursery slopes half-way up the mountain and the ski school is excellent. This is really an intermediate resort, however, with plenty of long reds to cruise in the sunshine. The pistes are also uncrowded and snowsure - ideal for those who just want to cruise the whole day. Experts may be a tiny bit disappointed but there is some off piste to be had. The lift pass also covers the unlinked resorts of Santa Caterina (20min down the valley) and Livigno (30 min) for those that want more variety. Also: an hours drive is well worth it to visit the hallowed slopes of St. Moritz. The town of Bormio is divided into two distinct parts - the old, pedestrian, centre and the outlying new developments. The centre is beautiful and full of architectural charm while the outlying part is less charming. There are plenty of very good inexpensive restaurants dotted about both the town and the mountain and the subdued nightlife make this the ideal resort for families and others wanting a quieter holiday. It was great there. I enjoyed myself and had such a fun time. The town itself is bursting with character, the town centre is closed off to traffic making it an extremely pleasant place to do shopping and soak up the atmosphere over a coffee. The main slopes start at Bormio 2000. These are largely tree lined pistes which benefit from the spectacular backdrop of the Italian alps. Gondolas provide fast access from the village to Bormio 2000 where an excellent restaurant is located along with ski hire and ski school bases. Tuition is excellent; by the end of an intense week of skiing most beginners will find themselves parallel turning on red slopes. 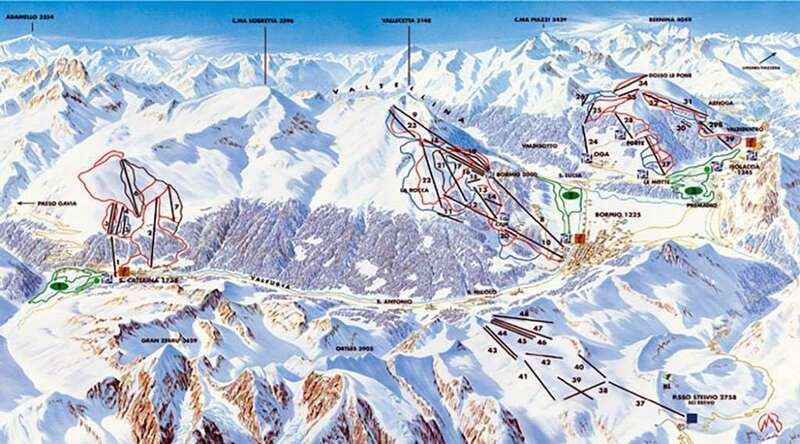 The resort provides good nursery slopes and blue slopes, although most slopes are suited to intermediates (red slopes). The efficient lift system provides speedy access around the resort. Bormio is well worth a visit whether you're a novice or expert, or even a non-skier.